The Ukraine Crisis Media Center project received the Bronze Lion award in “Entertainment Lions for Music” category at the Cannes Lions International Advertising Festival. The victorious project “Witness” is a memorial campaign devoted to the 75th anniversary of the Babyn Yar tragedy. It is for the first time that such an award was given to a Ukrainian campaign. The Witness project is a reminder of the greatest tragedy of the Jewish people during the Second World War. The tragedy, which was not only national, but global. The combination of haunting music, touching children’s singing and original production emphasize the fact that memory will live. “Although no artistic work has saved humanity from war, blind faith in such a possibility is the only prerequisite for successful creativity,” noted Sviatoslav Luniov, Ukrainian composer, author of “Witness”. “For me and my team, this Bronze Lion means even more than the Grand Prix because it is a breakthrough for the Ukrainian advertising and PR-community. We have finally broken the vicious circle, which has been preventing us from climbing higher than just a shortlist. Besides, I think that today the Bronze Lion is better for us than the golden one, because the Grand Prix or Gold is like the ultimate milestone in the route. However, there are new challenges ahead. How have we managed to win the award? Apparently, many factors contributed to it. Among them are the exciting tragic theme that does not heal over, extraordinary music by Sviatoslav Luniov, who in my opinion, is genius of a composer, and the extraordinary ability of young singers to voice the pain of millions innocent souls. All add up to our victory. If it were not for some technical problems, we would have fully implemented the idea and won a golden award, I’m sure,” said Gennadiy Kurochka, author of the idea and board member of Ukraine Crisis Media Center. The Witness project was part of commemorative events for the 75th anniversary of the Babyn Yar tragedy in September 2016. The creative concept was based on Solomon’s quote “Speak up for those who cannot speak for themselves …”. 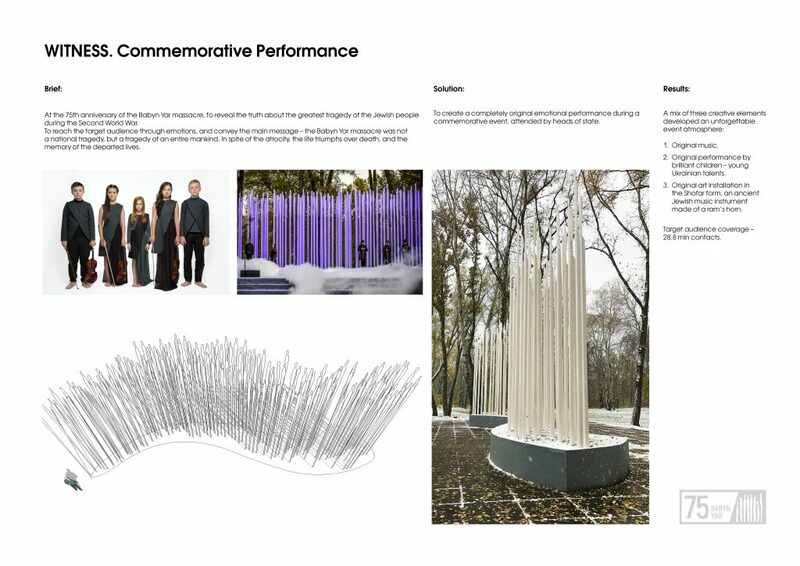 “The purpose of the project was to prove that every living person has the responsibility to speak up for those who perished – this is the true meaning of this simple and insightful idea-call, which immediately resonated first with the members of the organizing committee in Ukraine, with international partners, with the whole creative team that worked tooth and nail, with event participants, and eventually – with judges in Cannes. Like the Witness, UCMC has a great mission to speak up for Ukraine on the most important sites and on the most important issues. The Cannes Lion, first and foremost, is the great victory of Ukraine, a strategic idea from Ukraine that confidently puts us on the creative map of the world. I believe, there are still many victories ahead, but now I am proud of the team and all the projects that have built the foundation for this Ukrainian breakthrough,” commented Natalia Popovych, board member of Ukraine Crisis Media Center.